The Electro Thermal Link 74°C [ ETL® ] is a multi-purpose, dual responsive fusible link/release device. The fusible link portion functions identically to an ordinary fusible link - ambient temperature nearing the rated temperature causes the low temperature alloy to melt, allowing the link halves to separate. The ETL® can also be actuated by an electrical impulse. A 0.2 ampere minimum trip current applied for 50 millisecond minimum duration starts an irreversible chemical reaction that melts the fusible alloy and causes link separation in 6 to 10 seconds at standard temperature. 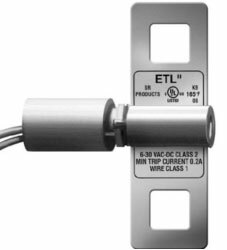 The ETL® was designed to substantially improve life safety and minimize property damage by providing both ordinary fusible link response in the event of fire along with the capability to instantaneously respond to any type of fire, smoke, infrared, light detector (etc.) capable of supplying a short duration current impulse. The design allows for ETL® substitution or retrofitting of ordinary fusible links and other actuators or release devices installed in: dampers; doors; roof hatches; towers; extinguishing systems, and inert chemical or gas release systems. An inherent major advantage of the ETL® over other products is the dually redundant dormancy – it draws no current and stays inertly in place until actuated, then functions and separates in seconds. The ETL® is designed and intended FOR INDOOR (or sheltered) DRY USE ONLY. The ETL® is an Underwriters Laboratories® listed device manufactured to exacting space age standards.